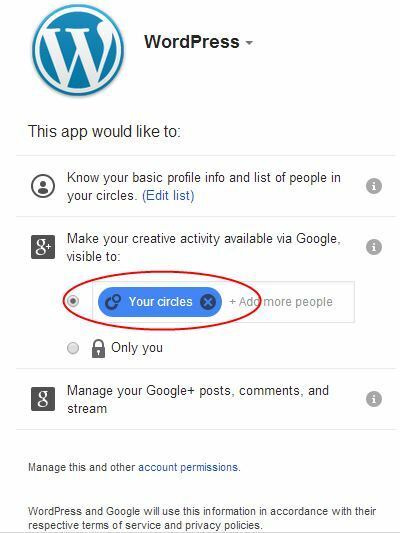 Make sure Jetpack G+ publicize settings work for you. Just a quick post covering the G+ sharing in Jetpack publicize settings, but it caught me out at the weekend, so I thought I’d share in case anyone else has done the same thing. When you set up Jetpack publicize you can connect a number of different networks, including Google+. I’d done this for my new photography blog, hosted on wordpress.com. (You find this setting under Settings>Sharing there.) And then I noticed that when the posts were being shared, they were marked private, and were going to a limited audience. It turned out that when I’d set it up, I’d left it at the default G+ setting, which was My circles, instead of opting for Public. I hadn’t gone into the dropdown alongside where it said my circles and changed it. I disconnected, and reconnected, and this time made sure I went for public. There can be reasons for sharing just to your circles on G+ but when you’re auto sharing, you probably do want it to go as wide as it can. Plus if a post is shared to circles and someone goes to reshare, they will get a warning about limited audiences, which might put them off. Personally, I’m going for sharing as widely as I can on that auto share, if I want to fine tune, I can do that when I share manually. Hope that’s a helpful tip for you, if it is, please share it on! Thank you! I overlooked this during set up, too. To make things worse, it also looks like you can’t change the sharing setting on G+ posts to “public” once you’ve auto-shared privately. Jatpack is a great plugin which is a bundle of various wordpress relates services like blog comment, spam protection, site state and other, I also use this great plugin into my own self hosted website.. Thanks for taking the time to comment, even if it was mainly because you wanted to leave a link to your site. Didn’t work – links in comment body are nofollow and I’ve removed it anyway.